Gregory Benford, author of top-selling novels, including Jupiter Project, Artifact, Against Infinity, Eater, and Timescape, is that unusual creative combination of scientist scholar and talented artist; his stories capture readers — hearts and minds — with imaginative leaps into the future of science and of us. 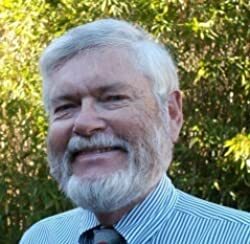 A University of California faculty member since 1971, Benford has conducted research in plasma turbulence theory and experiment, and in astrophysics. His published scientific articles include well over a hundred papers in fields of physics from condensed matter, particle physics, plasmas and mathematical physics, and several in biological conservation. Click here for more books by Gregory Benford. Timescape (1980) has been on my TBR list for 35+ years, I've long wanted to read physicist Gregory Benford, the book won the Nebula Award, and it deals with time paradoxes, which I find fascinating but invariably unconvincing. First off, most of the book’s considerable length is devoted to a slow-moving and detailed portrait of scientists (mostly physicists, but also some biologists and astronomers) at work in the lab as well as their personal relationships with colleagues and wives/girlfriends. So to describe this as a “techno-thriller” would be inaccurate. At the same time, Benford spends a lot more time on character development than most “hard science fiction.” In the end I had mixed feeling about this book. It was interesting at times but too slow-moving to generate much excitement.